While walking a teacher through the process of using her iPad as a document camera so that she could record her geometry lesson, we got stuck at the sharing part. It is all well and good to flip the classroom, to record your lessons so that your students can refer back to them, but how do you actually get the videos to them? The video files are too big to email. Having to transfer your video from your iPad to your computer just to upload it to a sharing device is a pain in the patootie and wayyyy too many steps. The “upload to youtube” seems perfect, especially since we use gmail and every student has a youtube account attached to it. Simple check the “Unlisted” option in the privacy settings where anyone with a link can view and you can either email the link to your students or add it to your portal. Except for lately, I’ve noticed that uploading to youtube just never works.This annoying problem has cropped up suspiciously with the new iOS 7 and I have not found a suitable solution. If you are frustrated that YouTube’s iOS app doesn’t let you upload videos, then you missed YouTube Capture’s release last December. Google decided to keep video uploading separate from video viewing. 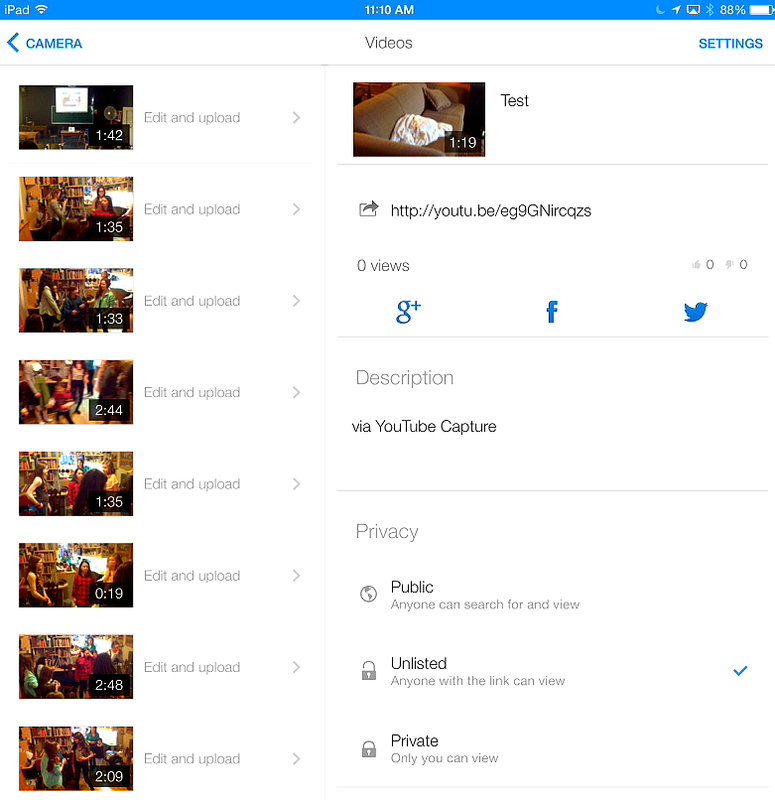 YouTube Capture made it easy to capture, lightly edit, and upload videos from your iPhone or iPod Touch, but there was no love shown for those who wanted to perform such a trick with an iPad. 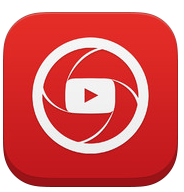 Now, with yesterday’s update, YouTube Capture is universal, bringing iPad videographers into the fold. Oh. So what you are saying is that I have been dealing with this problem for over a year and the answer was right there? A big fat slap on the forehead and Homer Simpson like Doh for me please. 1. Download Youtube Capture. Don’t worry, it is free. 2. 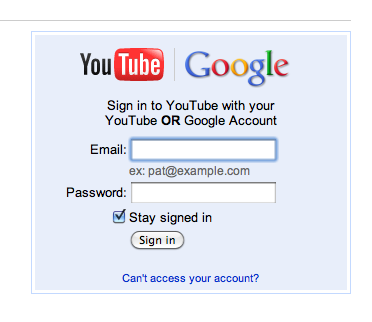 Sign in with your gmail account (for us at Traf, that means our school email). 3. Allow access to your camera roll and to the microphone. 4. Choose your video and edit it if you feel like being fancy (you can trim it just like in iMovie). 8. Tap Done and watch the magic happen! 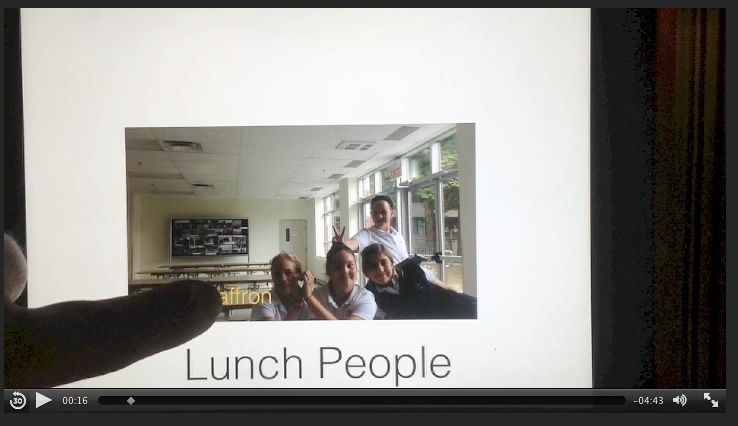 Mr. Scruton, our beloved math and multimedia teacher, has made a screen video using two iPads to show his Grade 7 multimedia class how to make a slide show presentation. This is a good example of how the iPad can be useful in a flipped classroom. Here is the link to a vid that I made by taking a video of one iPad with another iPad. I edited the film in iMovie, then exported. The exported file was way to big (on medium). I opted to jing the playback window from iMovie. There are some minor problems with stops (from the playback of iMovie), but otherwise is ok quality at very low size. I assume the Mr. Scruton, when faced with the large file, synced the file to his laptop and then used jing to record the recording. An alternative route to deal with large files would be to upload them to your youtube page and then share the link with a select group of people. All students at our school have youtube pages attached to their official email- it has been the way we have exported movies from the lab iPads to the teachers. 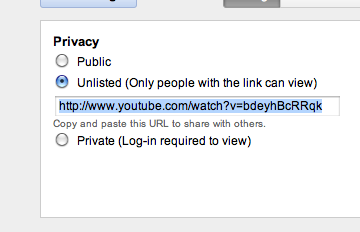 They only have to share the link with their teacher ( a simple click on the privacy options and voilà! 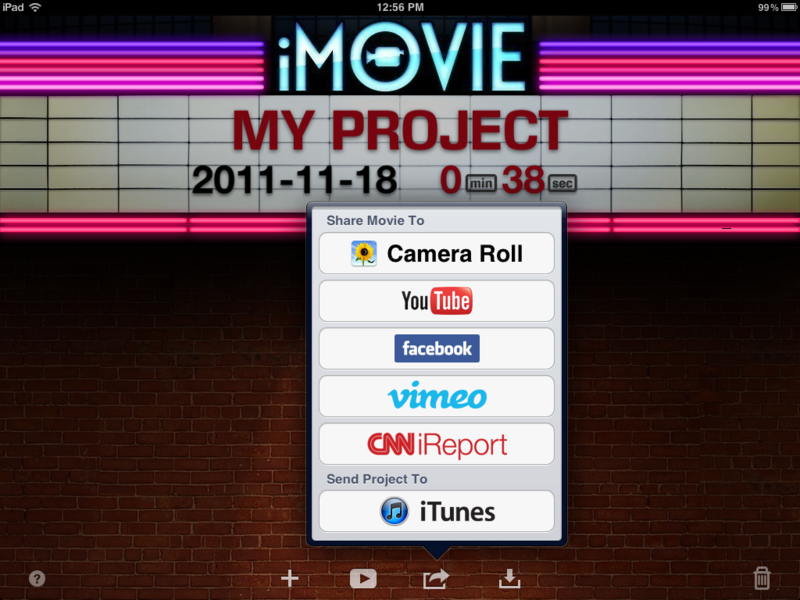 An easy way to get a movie off the iPad!